I loaded all of the gear in to the Jeep and headed out to have some breakfast with a couple folks who were out to work on their Rescue Diver certification. After that we all headed over to Balmorhea State Park to get checked in and start in on the diving. Check-in went smoothly, the rates are reasonable, and the staff was friendly and helpful. Unloading all of the gear was a good warmup exercise, and the weather was wonderful, with air temperatures in the mid-70s and rising. We had a little bit of a scheduling bobble, so I didn’t get in the water until after lunch, but it really wasn’t a big deal. We got started, worked through the skills in three separate twenty minute dives, and did some exploring while we were down there. I didn’t have any real issues, other than communication, but that’s something to work on. The PADI Open Water certification requires four open water dives, but PADI limits you to three dives, maximum, per day. So I’ve got one more to do tomorrow. 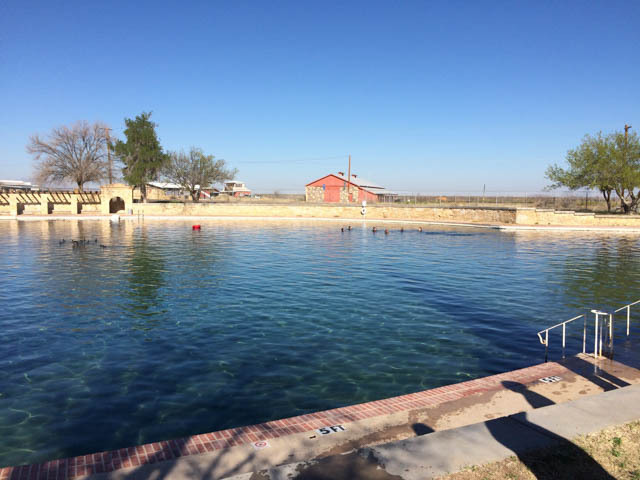 Balmorhea is a spring fed pool, and during part of our explorations, we got down to one of the places where the water is bubbling up from the ground. It was pretty amazing to see the sand dancing in place and feeling the current. I also got to see a couple catfish, which were pretty chill about the whole diver swimming around with them, and one crawfish who decidedly wasn’t and disappeared as soon as possible. After finishing up the diving for the day, I loaded the Jeep up and headed back to the motel to unload, update my log book, and chill before heading out to dinner. While I was there, I called home and checked in. It was probably a good thing that I did, because Heather let me know that a pretty severe ice storm was going to hit tomorrow. Now in scramble mode, I talked to the inn keeper, who was completely understanding about canceling my reservation for Sunday night. After finishing that, it was back to packing the Jeep and getting everything else ready to go in the morning. The new plan is to get up, eat, get the last dive in, and hit the road for home as soon as possible.